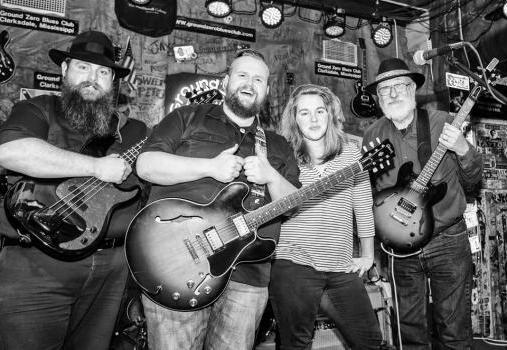 THREE RIVERS — Taylor Made Blues Band, a blues band “from the heart of the Mississippi Delta,” will be coming north to entertain Riviera Theatre on April 19 at 8 p.m.
Kolassa said the band started three years ago. Originally, the other two members of the band were from Taylor, Mississippi, but Kolassa said that he’s the only on left from the area. For the Riviera concert, he will be joined by David Dunavent, a Sumner, Mississippi, native, on guitar and additional vocals; Seth Hill, and Atlanta native, on bass; and Lucy Kate Piper, a Great Britain native, on drums. Kolassa said that his main influences are blues musicians Muddy Waters, the “father of modern Chicago blues,” and Howling’ Wolf, one of the best-known Chicago blues musicians. Kolassa also said where he grew up influenced his music as well.